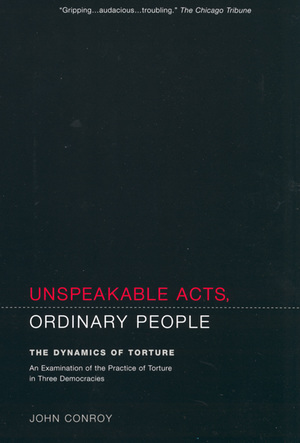 Unspeakable Acts, Ordinary People is a riveting book that exposes the potential in each of us for acting unspeakably. John Conroy sits down with torturers from several nations and comes to understand their motivations. His compelling narrative has the tension of a novel. 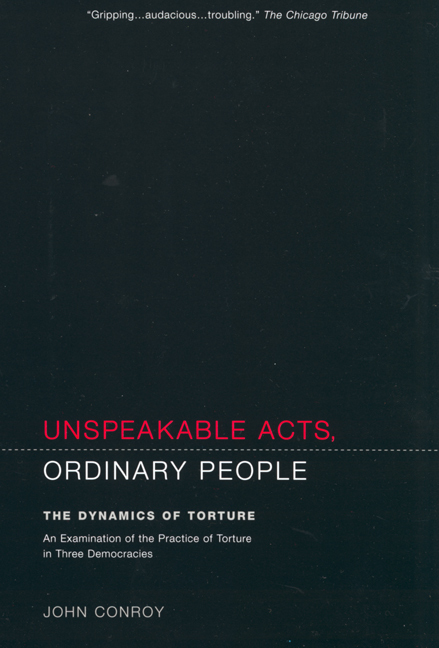 He takes us into a Chicago police station, two villages in the West Bank, and a secret British interrogation center in Northern Ireland, and in the process we are exposed to the experience of the victim, the rationalizations of the torturer, and the seeming indifference of the bystander. The torture occurs in democracies that ostensibly value justice, due process, and human rights, and yet the perpetrators and their superiors escape without punishment, revealing much about the dynamics of torture. John Conroy is a staff writer for the Chicago Reader and the author of Belfast Diary: War as a Way of Life. His work has appeared in the New York Times, the Washington Post, and many other publications.